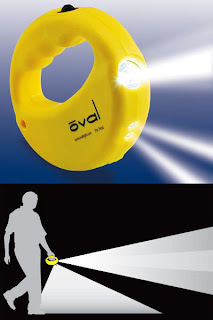 In the "why didn't I think of that" category, this flashlight from Oval (and through Gizmodo) lights both the path ahead and the ground immediately under the user's feet. Very nice - at least for the one purpose of walking in the dark. In other situations, the awkward shape, questionable aesthetics, and battery-hogging multiple lights may be less desirable. But it's neat to see a highly specialized product in a category--flashlights--where pretty much everything is very general-purpose. And jeez, why didn't I think of that...?